As I’ve discussed a few times, I’ve been dealing with shoulder pain for the last few months. As I’ve been fighting through this, one of the things I’ve been reminded of is how many purported breakthrough or unconventional cures are offered out there, that promise to avoid the often frustrating limitations and ambiguity of evidence based medicine. For someone suffering from health ailments, the siren call of these too-good-to-be-true miracle solutions is often overpowering. It’s hard to be a skeptic when you’re in that situation, even though that’s when it’s most necessary. One area that remains a powerful lure for many people is the promise of homeopathy. 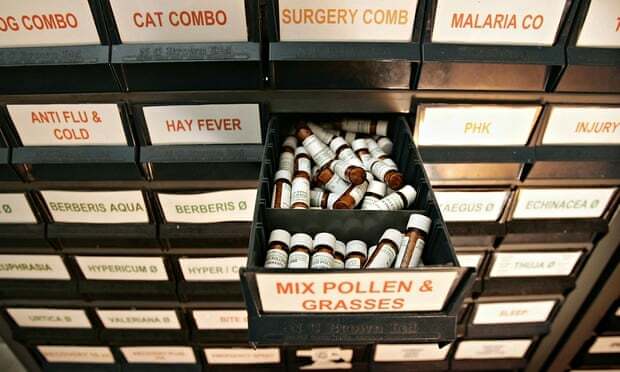 But that promise is an empty one: There is no scientific case for homeopathy: the debate is over | Edzard Ernst | Comment is free | The Guardian. Now, the internationally highly respected Australian National Health and Medical Research Council have conducted what certainly is the most thorough and independent evaluation of homeopathy in its 200-year-long history. Already their preliminary report had confirmed that homeopathy is nothing other than treatment with placebos. There are many unknowns in life. Often these unknowns are unsettling or terrifying, but some appear to offer a ray of hope. I’m not particularly fond of squelching people’s ray of hope, but false hope can lead to dangerous decisions, not the least because it could steer us away from what might be limited but realistic chances for help. Homeopathy is one of those false hopes. It’s one that I’ve seen many highly educated people put their faith in, even after being told that scientifically it is nonsense. It’s popularity is a testament to the power of the human mind to believe something that it desperately wants to be true. But it doesn’t deserve that faith. At best it’s an utter waste of money, at worst it’s dangerous snake oil. This entry was posted in Zeitgeist and tagged Alternative medicine, Evidence-based medicine, Health, Homeopathy, Medicine, Science, Skepticism. Bookmark the permalink. Wait… you mean that copper wire underwear is just a scam? Whodda thunk it! That’s probably the key right there. There seems to be some small value in placebos — mainly in terms of managing pain — but it really just shows the power of belief. That would seem to lead to just enough “success stories” to provide a shred of credence. Too true. And if, through the placebo effect, someone thinks it did some good for them, it’s often difficult to convince them to revisit that perception. Placebos are fine if they’re harmless (although they can sometimes be expensive), but many aren’t harmless, if for no other reason than it can delay someone from finding real treatment. The problem here, just with bible students and other religious groups, is that they will keep their belief even if it has been ruled out scientifically. They will not accept the science. It is a form of denialism. Homeopathy has been ruled out decades ago, but the believers cling to it and in some places, they are quite powerful. It’s worse than snake oil. Belief in homoeopathy undermines acceptance of science generally, and promotes the rejection of GM crops, vaccines, nuclear power, climate science and more. It encourages people to reject all evidence-based approaches to understanding the world. If I’ve exhausted all conventional routes, I might consider alternatives so long as they don’t seem likely to cause harm. Homeopathic remedies are automatically excluded in light of this definition: “The treatment of disease by minute doses of natural substances that in a healthy person would produce symptoms of disease. Often contrasted with allopathy.” No thanks! If the alternative remedy involves chanting and waving around sage or something, count me in. Actually homeopathic remedies are perfectly safe. The dangerous substances are so diluted that the probability of there being a single molecule of the original active ingredient in the final medicine is infinitesimal. So all you are actually taking is a sugar pill, some water or some other innocuous delivery substance. To emphasise the point, the anti-homeopathy 10:23 campaign have staged mass overdose events where many volunteers would grossly exceed the maximum dosage of homeopathic treatments to no ill effect. All the more reason not to bother with it, if you ask me, but not because homeopathy is dangerous. Well that’s a relief! At least it’s not harmful, unless of course you count those people who want to reject real medicine and decline proper treatment in favor of this. I think the reason it’s often regarded as possibly being dangerous is that there are numerous cases of people forgoing real medical treatment because they think the homeopathic treatment is working. I suppose the actual danger is in listing to homeopathic practitioners’ advice about medical treatment. I can imagine where you’re at, and I’m glad you’re waiting until all conventional routes are exhausted. Thanks for the site! Yeah, I’m sticking to the conventional route plus sage waving for good measure. I have a ways to go before my options are out. Besides, I know that even if they don’t figure out what I have, I won’t be left in the dust as far as symptom management goes. I wouldn’t do anything alternative without asking my doctor what he thinks of trying it. One of the most basic principles of medicine is that appropriate dosages are needed. Give too little of a drug and you get no effect. Give too much and there may be toxic or even lethal consequences. A base principle of homeopathy is that the more you dilute something, the more powerful the effect. (WTF?) If this were true then the more I diluted my Irish Whiskey, the faster I would get drunk. It is amazing that anybody believed any of this for any time at all. I think few people actually understand exactly how homeopathy is supposed to work. Many of them confuse it with herbal remedies and such. When they do understand it, they usually have no clue that the main ingredient is typically diluted to the point where it’s not there anymore.